Kavarna is a coffeehouse and restaurant in Green Bay, Wisconsin. It was opened by Linda in November of 1999. Her husband Alex's involvement began in 2005, when they decided to make Kavarna a family business. 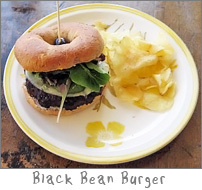 Kavarna serves a full menu of delicious, vegetarian foods designed to appeal to the vegetarian and meat-eater alike. They are also ridiculously committed to providing their customers with strong coffee, well prepared espresso drinks, the best selection of tea in the region, and other fine beverages. 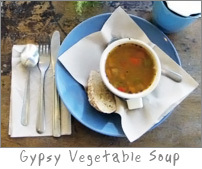 I like their vegetarian food like their Gypsy vegetable soup and their hot wraps. Their strawberry rhubarb pie is also worth having and I usually don't like having the strawberries in with my rhubarb. They also have a good selection of fine chocolate and their batidos are good. Just when it seems that every restaurant has nothing more than the obligatory 1 to 2 vegetarian options, a place like Kavarna shows up on the radar. Delicious, creative menu with a serene coffeeshop atmosphere makes this a terrific choice for the enjoyment of food and health. Kavarna is a unique and delightful place to eat, have a cup of coffee, enjoy connecting with friends or just relax and read the paper. The atmosphere is warm and inviting. The food is amazing. It is a family friendly, creative and inspiring place to be. Along with featuring local artists, Alex and Linda also bring in fantastic music! As musicians ourselves, it is one of our favorite places to play. Kavarna is a vegetarian coffee house and restaurant. It is located in an old building with the original tin ceilings and walls. Its décor has many whimsical features such as a wooden white chair hung high on the wall with cardboard cut outs of two people with mugs of coffee and an oval mirror hung high in a corner by the front door. In the front of the restaurant are two comfy chairs by large picture windows, an old rustic table, large plants, a bookcase that hold mugs and t-shirts for sale, and a cork board loaded down with various business cards and newsletters. Besides the menu they also have two chalk boards with different specials of the day and on the counter in a clear glass case were chock-full of delicious homemade bakery items and bars. Towards the back of the restaurant hanging on the walls are various art pieces by local artists which Kavarna changes every few months. There is also a very large book case full of old board games for your enjoyment. When you are ready to order you go up to the counter to place it and also pay your bill at the same time. They then give you a card with a word on it to put at your table, mine was tulip. You help yourself to water, napkins, and utensils which are located on a side table. I ordered a cup of their Gypsy vegetable soup for $2.75, their Black Bean Burger for $7.25, a mug of tea for a $1.95, and for dessert a huge homemade chocolate chip biscotti for $1.95. The restaurant looked clean and folk music played in the background. The server brought my soup and tea first. My cup of soup was heavy with vegetables including garbanzo beans,celery, corn, carrots, yams, and red and yellow peppers; it had a slight spicy and sweet flavor and tasted very good. The server cleared my soup cup and brought my burger but that was the last I saw of her. The burger was spicy and served on a very soft bagel that was covered with garlic cream cheese and topped with red onions, tomatoes, red pepper, and melted pepper jack cheese. The burger was soft and had a pleasing flavor. My biscotti needed to be soaked a while for it was very dense and hard but it was fresh and tasted yummy. Kavarna is the only vegetarian restaurant in Green Bay and they also carry vegan and gluten free items.